Traveling solo can be a daunting experience. However, it also means you can enjoy the freedom of going wherever you want, stopping whenever you choose, and lingering for as long as possible. It can be a relaxing and enjoyable experience, but before you jump in the driver’s seat, there are a few things to keep in mind before you go at it alone. There are a couple of things you need to know as a solo traveler. Firstly, you should always get your RV inspected by a mechanic before you hit the road. Make sure that everything is in working order, and if something is wrong simply get it fixed. Double check that you have packed all your essentials too! You don’t want to be stuck without your must have items. For those with less experience driving RVs, you could take a class. If you don’t have time on your side, go for a spin around the block until you feel more comfortable. Otherwise, take your family or friends on a trip. Get a better idea of how everything is supposed to be, from unhooking, to driving, to cooking; then you should be good to go. It’s always safer to travel with others, so if you’re traveling alone make sure that you don’t put yourself in any danger. Since you have had your RV checked, make sure you’re aware of sounds your travel trailer may be making just in case something isn’t right. Also, for your safety don’t stay any place that makes you uncomfortable. If an RV park feels somewhat sketchy, then trust your gut and move on. Finally, when you park, position yourself so you can leave quickly if there’s an emergency, and lock your door at all times. Just because you’re traveling alone, it doesn’t mean you need to feel alone. There are numerous ways to connect with others when RVing. One way you can meet people is by joining an online forum and finding people who are in your area. Many RV enthusiasts will choose a location to socialize from. If you find that meeting new people is a struggle for you, try and keep in touch with friends and family through phone calls and video chats. 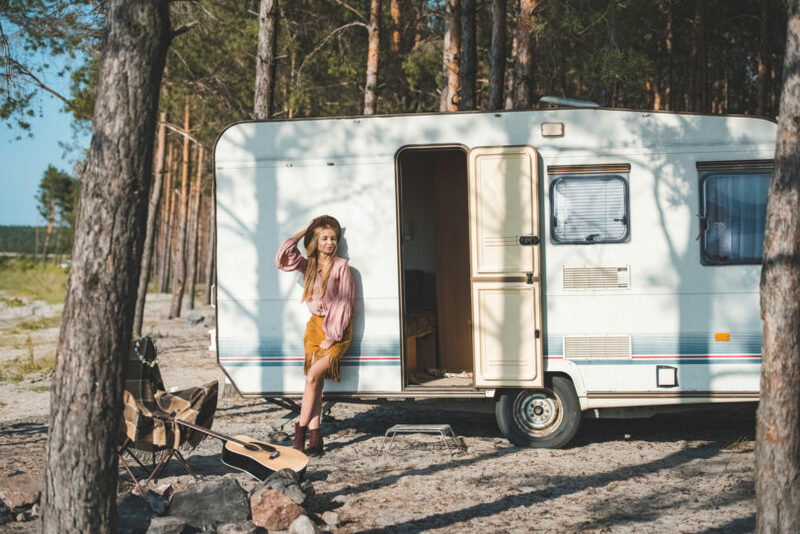 Try and branch out if you can, as the exciting part of solo RV travel is the possibility of finding groups of people you might not have crossed paths with otherwise. Finally, if nothing else, bring your dog along for the ride. Dogs are great companions and perfect for uplifting the spirit. There is a big difference between traveling alone and traveling with others. Going solo has it challenges, but it can also be one of the most fulfilling things that you will ever do.